Junior Shun Kent locks up on defense against Valparaiso. Kent led the Braves with 17 points. 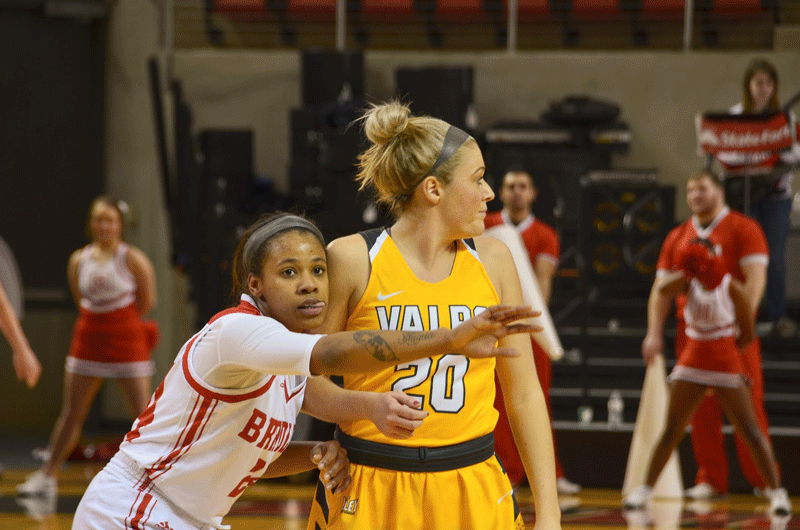 The Bradley women’s basketball team closed out a four-game home stand last Friday by beating Valparaiso and falling to Loyola on Sunday. The Braves’ record for their homestretch was 1-3. 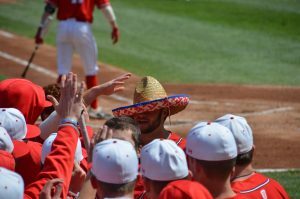 Bradley hosted the Missouri Valley Conference’s newest member Friday, but was not so welcoming. The Braves jumped out to an early lead and closed out the first quarter with 21-8 lead. Bradley played stifling defense, allowing just 14 points in the first half accompanied with a 45.1 field goal percentage on the offensive side of the ball to lead 35-14 at the half. The Crusaders were able to whittle Bradley’s lead to as little as six points with just over a minute remaining, but the Braves hung on to win 69-58. By the end of the game, three players were in double figures for Bradley. Senior Vanessa Markert scored 12 points, junior Shun Kent scored 14 and freshman Gabi Haack scored 13. 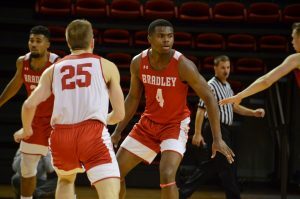 The Braves tried to keep the momentum rolling on Sunday against Loyola, but struggled to get things going early, as Bradley trailed the Ramblers 26-23 at the half. The Ramblers outscored the Braves by 11 in the third quarter, during which Bradley only shot 13.3 percent from the field. But it looked as if the Braves had started to rally in the fourth quarter as they were able to start pressing and force turnovers. However, freshman forward Nyjah White got into foul trouble, preventing Bradley from pressuring Loyola any further. With no press, the Braves’ rally was not enough, and they fell 71-61 to Loyola. 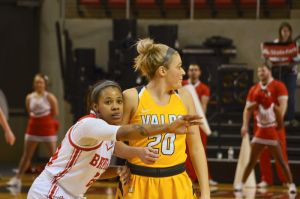 Bradley struggled to get their leading scorer freshman Gabi Haack involved early, as she knocked down the first shot of the game, but did not take a shot the rest of the first half. Gorski said the Braves need to get Haack more involved early. Despite only taking one shot in the first half, Haack finished with 10 points and 10 rebounds for her second double-double of the weekend and third of the season. Joining Haack in double figures was Kent with 17, Markert with 10 and senior Anneke Schlueter with 10. 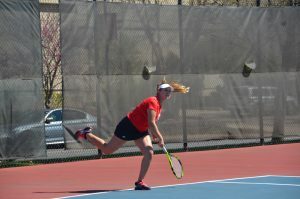 Haack said the Braves’ rally fell short because the team did not show up with a winning attitude. The Braves were outrebounded 41-34 by a team that came into the game averaging 10 less rebounds per game. Haack said lost rebounds late in the contest cost the team the game. Gorski said the Ramblers wanted the win more than the Braves. The Braves will look to get back on track this weekend as they hit the road for a matchup at Missouri State tonight at 7 p.m. and at Southern Illinois on Sunday at 11:30 a.m.